← What Colors Can Calm Us Down? I have to give credit to gray. For a color that is so neutral and really neither here nor there it’s really holding its own and STILL a very sought after hue. People want gray in their homes but sometimes get stumped when they have to tie in the rest of their decor to liven up this *quiet hue. So what colors go with gray and how can we jazz up our homes when gray is the feature color? The obvious choice is to add wall color to coordinate with your gray furniture. You can do so much with gray furniture, the options are really endless. But what paint color is the best choice to cooridinate with gray furniture? 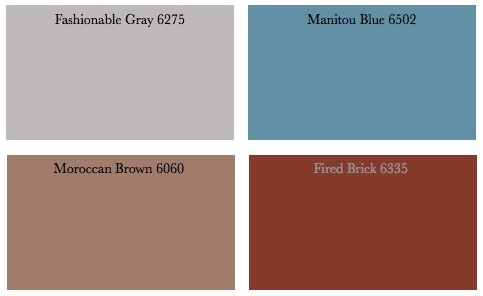 Here are some Sherwin Williams colors that go with gray. Looking at these colors you’ll see Fashionable Gray which will give you a monochromatic, classy look. It’s light, soft and versatile since it’s a fairly quiet color. You off course can incorporate more color into your room with pillows, throws, art and area rugs to bring in just tad more interest to your room. Have fun with this floral damask for drapery or if you’re not that brave, pillows would be perfect. Manitou Blue is the “in” color now and even a darker navy is an excellent choice but just about any blue will look amazing with gray. The “Re-Blue” as CMG refers to it adds a nice spin on the already very popular blues that we all love. Now Moroccan Brown is probably a color that you wouldn’t consider for your home but think about it for a minute. 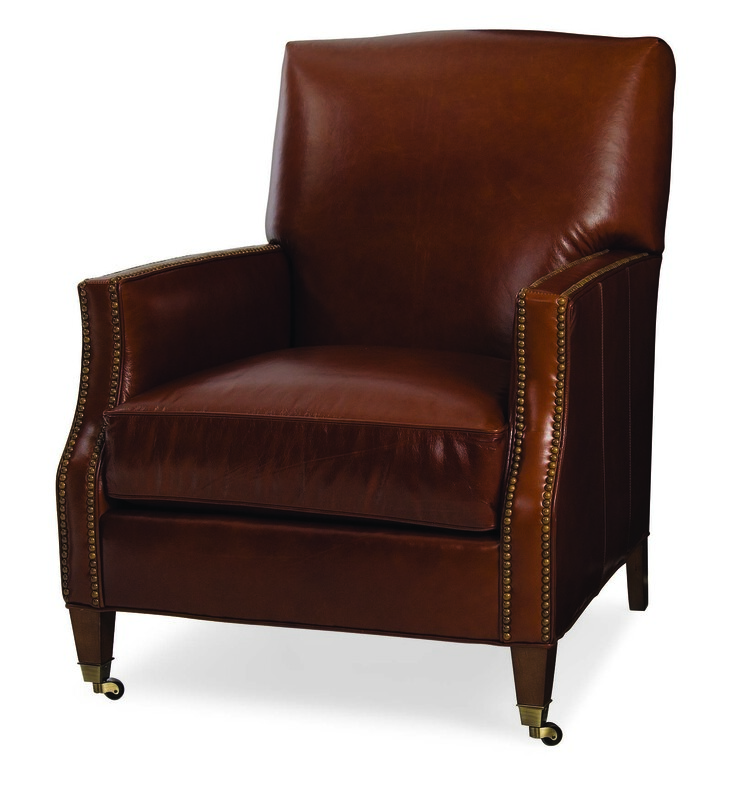 What if you have this Berkshire leather chair in your living room? It would look pretty impressive wouldn’t it? I would certainly use a warmer gray fabric for your furniture to tie in the yellow tones or warmness of this particular leather. Can’t you just see yourself sitting in that chair? Cozy. Fired Brick red will be the hue for you if you want a bolder more modern feel. This red will definitely be the focus in the room so you will really need a super quite piece of furniture to take back stage to this strong color. So, when you’re purchasing furniture for your home, considering gray is just smart. Like I said earlier, you can dress it up or keep it traditional. There is so much you can do with gray so invest in the best furniture you can afford but also, color is key here. *Quiet color – when I refer to a “quiet color” it usually just either a soft color or a neutral color that you really don’t notice right off the bat. This entry was posted in Color and tagged blue, CMG, color trend, colors that go with gray, CRLaine, gray, gray furniture, grey, navy, paint color, red. Bookmark the permalink. 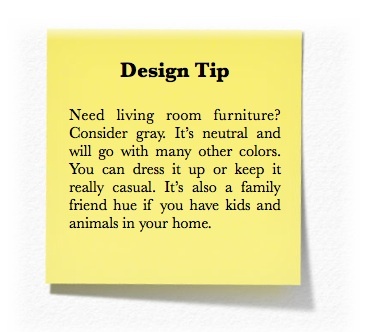 62 Responses to What Paint Colors Go With Gray Furniture? I’ve jumped on the gray-band wagon..maybe even a bit overkill, but I love it and it really does go with everything. I’ve mixed it with turquoise and bright orange in my living room with dark woods as well as lime and navy in my sons room…it really is that perfect color. Great post, informative information for our clients! Thanks Eric and that is one of my most popular posts. Gray is still a very popular color trend. Help! My once gray couch turned an awful green whenever we moved! We don’t have animals or smoke, So it has to be lighting and color related. The bulbs are super bright in the new place. I’m so in love with my couches (they have an aztec print to them with black and white as well) I REALLY can’t see myself getting rid of them. Any ideas about how to get my gray back?? Thanks! We are tinking accent colors of blues and either Moroccan red or yellow. Advice appreciated! Your sofa turned green? Sounds like it may have been too close to a window and the UV got it? Try using different lighting your home or repaint your walls to play off or work with your green sofa. Unless you can replace your sofa, I have no idea how to make it gray again. Sorry! I’d look into the beige’s that have a green undertone. That’ll look best with your red (mahogany) flooring. Try Inner Balance from Benjamin Moore. I just purchased a light gray vanity from home depot but am totally stumped on what color to paint the bathroom! Will a darker gray wall be overkill? It’s a light gray vanity with a bright white sink. Thinking a darker flooring, too. But those walls are just stumping me! Love a bright color accent with bath towels, etc.. too. Any thoughts? Thanks for your post! It’s helpful! Thoughts? Oodles! I’d like to start with not using gray for a wall color. Since your vanity is already gray you can really use so many colors. Have you seen Paradise Found by Voice of Color? I’m really pushing greens now and the sage greens will be a nice transition along gray. Try it and see how you like it. Thank you! I will check it out! I was totally going to go with a dark gray but let me check this out! I have a new Dove Gray (light velvet gray) upholstered headboard with brass colored nail head wings in my room and am trying to figure out if I want to paint, and if so what color (faux or solid) or wallpaper the accent wall. Thinking maybe a beige with gold highlights. Not sure. Any awesome suggestions? Be careful with gray and gold or beige together. Unless it’s a warm gray, it’s going to look weird. I’m all for solid painting and not faux but then again, that would depend on what type of faux you want. This is why I hesitate to answer some color questions here. If I don’t have pictures, location and color names, I can’t professionally suggest colors for you. This is why I have a Virtual Color Color consultations available. Some are just $85 for a basic – which I just helped someone who needed advice on brown – and the pricing goes up if you need color for your entire house. So sorry I’m not too much of a help here. Feel free to contact me via email if you need detailed information. Well the good thing about the headboard Janette is that it’s a neutral color. You can use just about any wall color with that. Do something fun and unexpected, try a gray with a slight lavender tint to it. Hi i just got a med gray leather couch now I need a new dinning room table my living room and dinning room is all 1 big room I was just wondering if I buy a gray dinning room table will it look good together. Oh that’s super tricky!!!!! Be careful Maria. The grays need to be really close in hue or they’ll clash. I’d recommend coordinating colors instead of trying to match. How about a charcoal gray or black table? That probably would look better. I just moved and bought a dark gray leather rap around couch and my walls are all white. My carpet is a light beige color and all my pictures are black & gray. Also, my end table and coffee table are like a marble color with black & different shades of gray. I really need to get rid of these white walls and paint but I have no idea what color/colors?? I’m new to gray furniture. Any help would be appreciated! Michelle – I would need to see pictures of your rooms so I can tie in your decor. There are so many colors that go with gray. I have a gray sofa t0o and a very unique wall color. Send me an email at DecoratingbyDonna@mac.com and we can talk about your options. I’m using Valspar paint because they have a really nice selection of greens that I love with gray. Chat soon! I need help selecting a paint for my walls. Just purchased the Gia Grey Sofa from Crate & Barrel. My apt does not get too much light ..
Oh pretty! 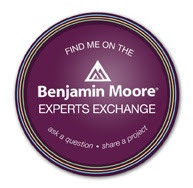 Did you try Gray Owl by Benjamin Moore? That’s a nice clean one. I did and it has a tint of blue. I’m obsessed with lime green and gray.lol and I wasn;t sure if the Gray Owl would work..
Well blue and gray and beautiful together. Sample it out. I can’t suggest a Lime Green without seeing your flooring. If you want, I have a color service available for that if you want additional help. How much would that cost? I def need help. I have a Basic Color Consultation where I offer three color suggestion for you for $85. I’ll send you a graphic what will have the picture of your sofa with three color boxes under it for you to choose from. My office will be closed till next Tuesday so if you need help, next week would be good for me. My floors are a cherry wood. Hope I did not make a mistake with grey sofa. Let me talk to my husband and get back to you . More than likely will hire you!!! Keep in mind gray and “red” are classic color buddies. Remember the gray and burgundy look? Same thing. You’ll be fine. Now if you have maple floors, I’d be nervous. OH what a relief!!!! The rug I purchased is grey and cream? Is that okay? Thank you Donna!!!! You have been very helpful!! I will contact you again for help in selecting the paint. How does it work when hire you for the paint? Will someone come to my house? Or do I send pics ? I’m very excited. Aww thank you!!! Will reach out to you sometime after Thanksgiving then. Ok, I’m in need of some help. My living area is open (the walls are a light gray- Sterling from Behr), I have a dark gray sectional with a multicolored rug (orange, green, pink, turquoise, and small hints of purple, yellow and red). I have two off-white armless accent chairs (my attempt to lighten the area). My dining room has a black, triangular, table with white leather barstools. I am struggling with adding color & contrast to my walls. Also, I want to incorporate burlap into my decor, but am unsure. The fireplace in my living room is bricked from floor to ceiling (the bricks are smeared, so they’re a light tan) and the mantle is a natural wooden block. Please Help!! Wow!!!! Ok – you do know that I can’t 100% offer advice without seeing pictures of your home. I do have a color consultation available if you want to more precise help. I can tell you this – it sounds like you have a lot going on. Between the colors in the rug and all the textures you have and want to bring in – honestly, I don’t know if I’d bring any more in. This is would be a perfect opportunity to rearrange your room and minalimize your space. You may have too much going on. It sounds like you have good bones but again, without me seeing what you have it’s a challenge. Try bringing interest in to your room not with color at this point but with lighting. Experiment with some upright or accent lighting that can feature some of the spaces in your room. This will always obviously lighten your area. Keep in mind, sometimes less is more. Did you send me an email about this already? I’ll need to see a photograph of this room. Please send me an email at DecoratingbyDonna@Mac.com. There will be a charge for this service. Hi Donna, my bedroom furniture is platinum… what color paint would you suggest…. Well that would depend on the rest of your home. What color flooring, tile and granite do you have? I’d make sure the undertones were all the same. Since your furniture is platinum you may have a larger range of color choices. If you’d like, I can offer you a Virtual Design service. Send me an email with your furniture and a some of your surrounding rooms and I can better assist you with a color choice. Hi Donna. I have been trying to see how I could bring this family room together with this gray leather furniture. I want a lake cottage feel but don’t know own what to do for paint color or rug choice. Any suggestions? Cottage feel? Try a cream color or light, pale blue with white trim. It really depends on which gray you have – cool or warm – that will determine the answer. If you have a warm gray sofa, try a cream wall. If you have a cool gray sofa, try a pale blue. Hey Donna! I just bought a silver grey couch from Ashley’s Home Furniture. We’re moving in to a home that has 1 window, a bay window, in the living room, facing south. The walls have a chair rail. What would you suggest painting them? I’d originally thought a beige and white (below the chair rail). But I’ve read online I should do a cool color like grey. I have accents of turquiose and I like the farmhoueThanks for the help! I have chestnut maple kitchen cabinets with brown/grey and white quartz counter top, greyish/dark brown table with grey and light brown (almost cream) chairs. What wall colour and accessories would you suggest. Also what backsplash should I get? I would like a little bit of colour but not to much. Hi Kathy – I’m going to hop right in and suggest a spicy orange accent color for your kitchen. You can see that colors in some of my newer posts in the blog. As far as wall color, try Olive White or Spring Reflection, both from Valspar. They are in the green family – don’t bring in any more gray. As far as backsplash, you’ll already be in Lowe’s so look at the green/brown glass options. That will be pretty and will tie everything in.